4.1What day is it today? 4.2Is your food and drink healthy? 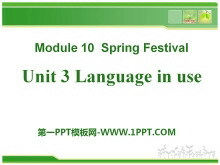 《Language in use》Spring Festival PPT课件2 Warming up Look at the following pictures and say what they are doing. Write the -ing form of the given words. 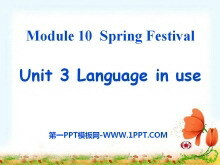 write sit begin visit study lie stop see bring talk swi..
《Language in use》Spring Festival PPT课件 objectives： 1. To ask and answer with the interrogative form of the present continuous tense 2. 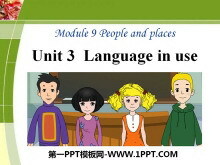 To use before to express time order Observe Are you familiar with t..
《Language in use》People and places PPT课件3 Review 根据提示，用现在进行时完成。 What are they doing? Two students ___ ______ the piano another __ ______ the flu. What are you doing? 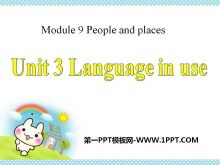 I__ _______ on the Great W..
《Language in use》People and places PPT课件2 等公交车 wait for a bus 吃冰激凌 eat an ice cream 喝桔汁 drink juice 吃午餐 have lunch 照相 take a photo/ some photos 写明信片 write a postcard 买礼物 buy presents/..
《Language in use》People and places PPT课件 What are we going to do? 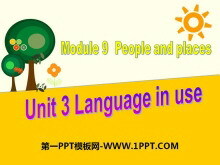 Today we are going to summarize the Present continuous tense. 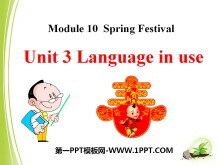 You will have four tasks（任务） to do this class. 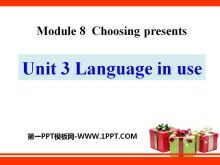 Try to get as many points a..
《Language in use》Choosing presents PPT课件3 objectives: 1. 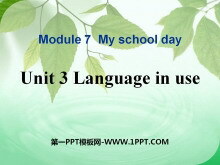 The use of present simple 2. Adverbs of frequency: always often usually sometimes never Language practice 1. Daming always gets birthday presents!.. 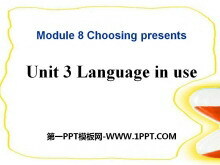 《Language in use》Choosing presents PPT课件2 objective: To summarise and consolidate the use of past simple regular verbs Grammar 一般过去时(Ⅱ) 1. Finally she pushed the door. 2. 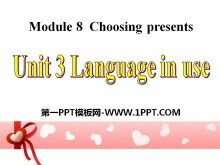 She didnt like the middle ..
《Language in use》Choosing presents PPT课件 buy a birthday cake 买生日蛋糕 make a birthday cake 做生日蛋糕 buy birthday candles 买生日蜡烛 have a birthday party 举行生日晚会 sing happy birthday song 唱生日歌 m..
《Language in use》Computers PPT课件3 How do you do your homework on the computer? Firstopen a new document. Use the mouse and clicknew document. 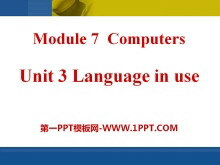 Next use the keyboard and write your homework. 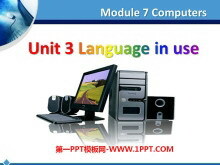 Thensave the docu..
《Language in use》Computers PPT课件2 1.park n.公园 我星期天去公园。 I go to the park on Sunday. v.停车 禁止停车。 No parking. 2.busy adj. 忙的，繁忙的 e.g.星期五我很忙。 On Friday I have a busy day. be busy do..
《Language in use》Computers PPT课件 与分享 share with 和他的顾客交谈 talk to his customers 上网 go on the Internet 查看火车时刻 check the times of trains 制定旅行计划 make travel plans 听音乐 listen to music ..